It's one of life's most beautiful truths: Joy that's shared is never diminished, but rather felt more wholly. And what could be more joyful than a lively litter of fluffy kittens? 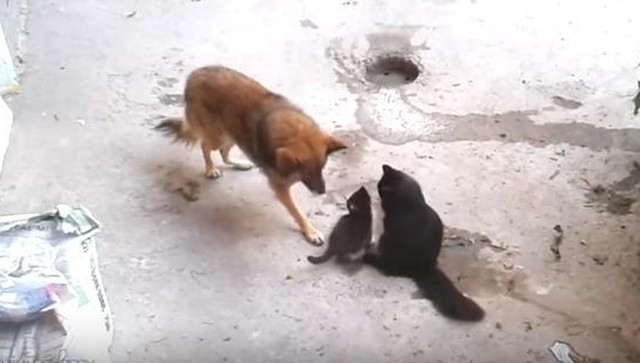 A video recently uploaded to YouTube captures the touching moment a cat led her babies along to introduce them to her old friend, who happens to be a dog. The feline mother shows no hesitation in allowing the eager pup to get acquainted with her offspring — which she does with tenderness and the utmost care. The kittens, too, seem to relish in their canine aunt, who's probably a bit more tolerant of their playful pawing than mom. There are few details with which to illuminate the backstory of these unlikely friends, but this little snapshot is such a happy one it hardly needs explanation. Responses to "Mother Cat Brings Her Kittens To Meet An Unlikely Old Friend"
im guessing they are all strays :( but this so really sweet and cute! cats & dogs can be friends. That is so sweet. My cat & dog play all the time. My dog is 7 lbs. & my cat is 12 but he's so gentle with her. So cool.....obviously Mom trusts her buddy to be gentle with her babies....just awesome, can't help but make you feel good.